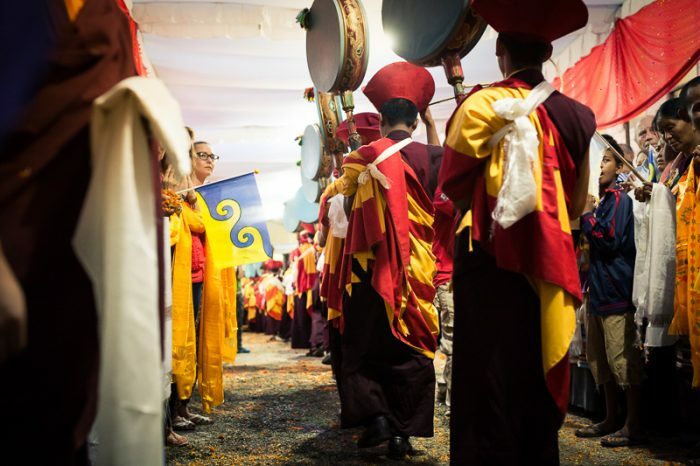 On July 30th, thousands of people lined the streets as Thaye Dorje, His Holiness the 17th Gyalwa Karmapa, arrived in Nepal to lead the cremation ceremonies for His Holiness Kunzig Shamar Rinpoche. Some of the waiting crowd waved “Karmapa dream flags”. These flags bear an auspicious blue-and-yellow symbol that His Holiness the 16th Karmapa had seen in a dream. It has deep symbolism, and the 16th Karmapa said that wherever it is flown, the Dharma will flourish. 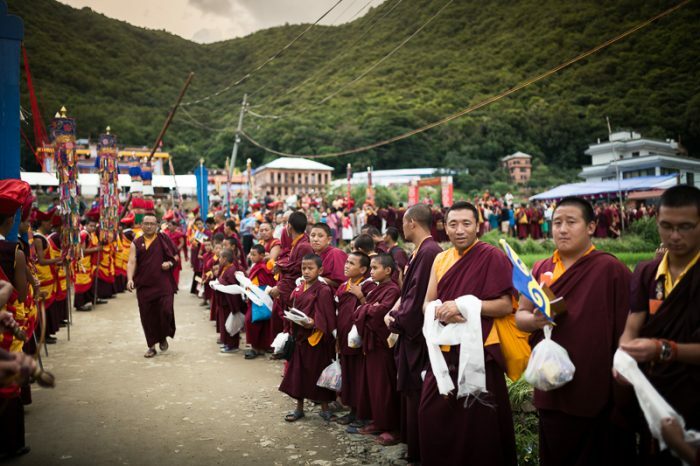 Monks from the Shar Minub monastery, which was founded by Shamar Rinpoche, had been preparing for weeks. The previous day they had received the body of Shamar Rinpoche. Now they welcomed the head of the lineage to the beautiful monastery, nestled in the hills just outside Kathmandu. 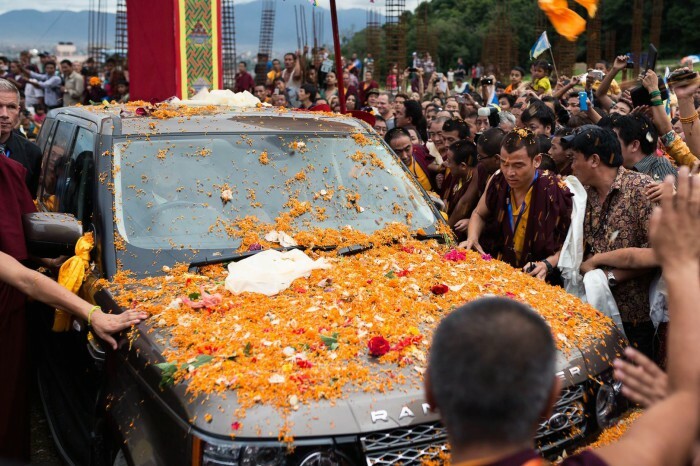 When Karmapa arrived, the waiting crowd threw flowers onto the motorcade in a gesture of welcoming. Previous Karmapas had visited the traditionally Buddhist country of Nepal and given teachings at different times. 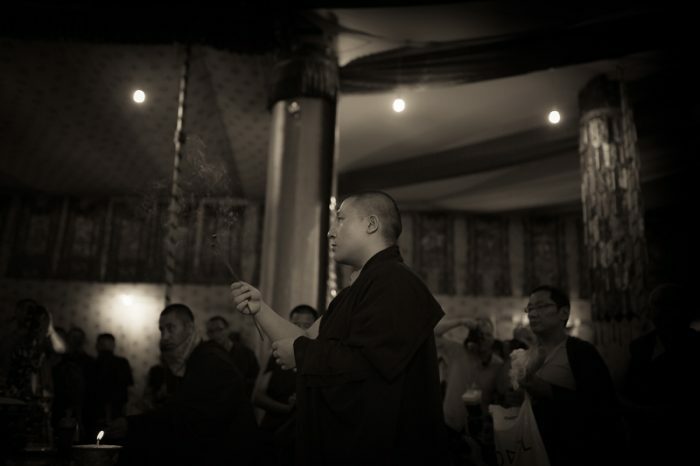 The 16th Karmapa came to Nepal on pilgrimage to visit several holy places including the main stupas in Kathmandu. This was the second time that the 17th Karmapa had been to Nepal. In 2001, he inaugurated a Karma Kagyu monastery in Lumbini. However, this was the first time that he had taught in the capital, Kathmandu. 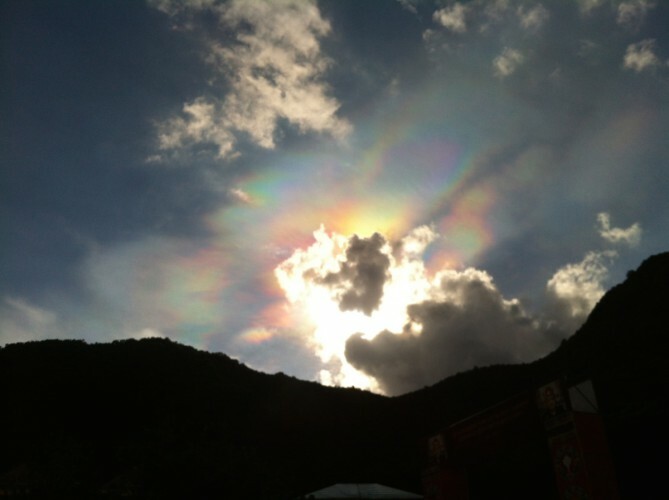 Later, while Karmapa was giving teachings in Kathmandu, rainbows appeared around the sun – a most auspicious sign.